Hans Holbein was a Roman Catholic who specialized in religious paintings. Some of his work appeared in Basel Cathedral. However, the city came under the influence of the teachings of Martin Luther. He did not approve of highly decorated churches and so Holbein found it difficult to find work. Holbein decided to live in a country that still remained Catholic and moved to England in 1526. Holbein also found it difficult to obtain commissions in England and in 1528 returned to Switzerland. In 1529 Basel officially became a Protestant city. "To celebrate gangs of rabid iconoclast rampaged through the churches looking for Madonnas to trample and smash. On the 9th February 1529, a gang of some 200 angry Lutherans broke into Basel Cathedral and began attacking the art, statures, crucifixes, Holbein's paintings and they did not stop until all their religious idolatry, as they saw it was destroyed." Holbein continued to find some work after the attack on Basel Cathedral but by 1532 things had become so difficult he decided to return to England. Here (in Basel, Switzerland) the arts are freezing, so Holbein is on the way to England to pick up some coins there. Your painter... is a wonderful artist, but I fear he is not likely to find England so fertile as he hoped. Yet I will do my best to see that he does not find it absolutely barren. Holbein's first visit to England lasted only two years (1526-1528), and he was probably concerned at this stage to retain his links with Basel. 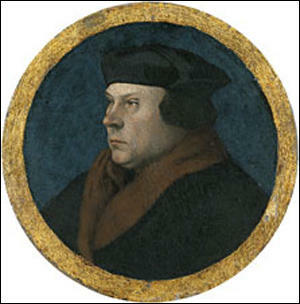 He also had work to complete there, but the advent of the Reformation, with the violent destruction of many religious works in 1529, must have done considerable damage to the livelihood of artists and encouraged Holbein's swift return to England; the last record of his presence in Basel is a payment for painting a clock face on 7 October 1531. 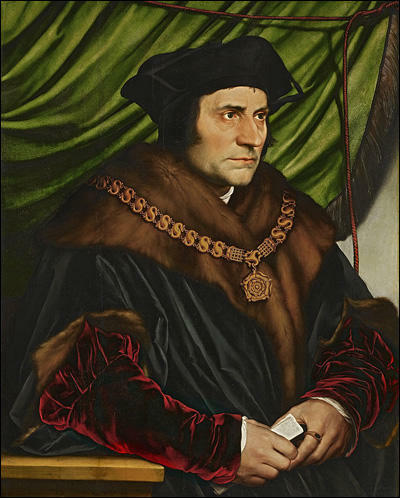 Sir Thomas More was the man who famously stood up to Henry, who refused to accept the king as the new head of the church. So Henry had him beheaded. I grew up believing that More was a man of principle. That is why the Catholic Church made him a saint in 1535. But more recently, a new Thomas More has been proposed to us. In today's histories he is often presented as a demented religious bigot. As a cruel slayer of heretics. That is what modern novelists and playwrights have been making of More. But it was not what Holbein makes of him (in his portrait of More) and Holbein was there. In the Living Hall of the Frick Collection, on either side of a fireplace, there are portraits by Hans Holbein of the two most illustrious politicians of the court of Henry VIII. On the left is Sir Thomas More, Henry’s lord chancellor from 1529 to 1532, who, when the King needed an annulment of his marriage, and therefore a release from the duty of obedience to the Pope, was too good a Catholic to agree to this. For his refusal, he forfeited his office and, eventually, his life. 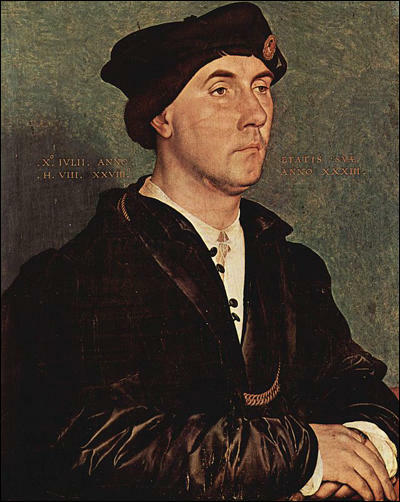 Holbein’s portrait shows him thin and sensitive, with his eyes cast upward, as if awaiting the sainthood that the Church finally bestowed on him, in 1935. On the right side hangs Holbein’s portrait of Thomas Cromwell, the minister who did for Henry what More wouldn’t. He wrote the laws making the King, not the Pope, the head of the English Church, and declaring the English monasteries, with all their wealth, the property of the Crown. To achieve these epochal changes, he had to impose his will on many people, and that is clear in Holbein’s painting. Cromwell is hard and heavy and dressed all in black. His mean little eyes peer forward, as if he were deciding whom to pillory, whom to send to the Tower. There are no metaphors in his Cromwell picture. There is no echo of his portrait of Thomas More: none of that swift intelligence, intensity, engagement with the viewer. What you see is what you get. Cromwell looks like a man hard to reach and hard to impress. He does not invite you to conversation. His posture is attentive, though, as if he might be listening to someone or something beyond the frame. It is as a murderer that Cromwell has come down to posterity: as the man who tricked and slaughtered the saintly Thomas More, the man who ensnared and executed Henry’s second queen, Anne Boleyn; who turned monks out on to the roads, infiltrated spies into every corner of the land, and unleashed terror in the service of the state. If these attributions contain a grain of truth, they also embody a set of lazy assumptions, bundles of prejudice passed from one generation to the next. Novelists and dramatists, who on the whole would rather sensationalise than investigate, have seized on these assumptions to create a reach-me-down villain. Holbein’s portrait is both the source of their characterisation, and a reinforcement of it. Southwell played a part in the fall of both Sir Thomas More and Thomas Cromwell.... More records that Southwell was sent to More's room in the Tower to take away his books. While there he heard the famous exchange between More and Sir Richard Rich in which the former chancellor denied that parliament could make the king head of the church.... 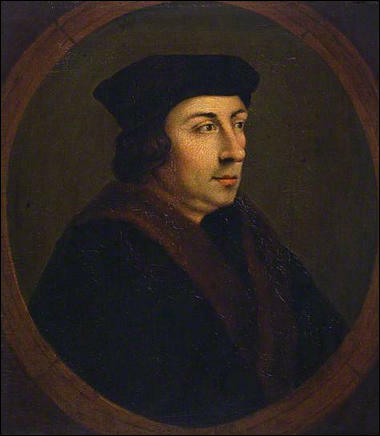 In March 1540 Southwell (who was presumably still loyal to Cromwell) was one of six men who took a deposition from one Thomas Molton, who was charged with having said that the world would never be quiet so long as one so base in birth as Cromwell served on the king's council. As might be surmised from the somewhat cold and sinister expression on Southwell's face, he has come down to posterity as one of the most calculating and treacherous members of Henry VIII's court. He became a creature of Thomas Cromwell and was instrumental in aiding Richard Rich in his attempts to force the imprisoned Sir Thomas More to incriminate himself in 1532. When I was at school Cromwell was portrayed by everyone as a terrible man. Henry VIII's enforcer, the destroyer of the monasteries, in recent years there has been a big reassessment and the modern image of him, the one you find of him in books, plays, as a decent and brilliant man, trapped in a difficult situation. Cromwell we are now told was an early civil servant who channeled power away from the monarchy and the man who invented the bureaucratic modern state. These days we are encouraged to see Cromwell as a good guy, but in this film I am not going to do that... Holbein's portrait of him (Cromwell).... Just look at him. He has a hard and charmless presence. 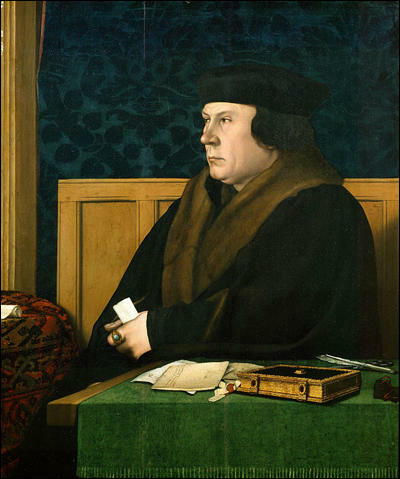 Those piggy eyes, that blank expression, Cromwell is surely the least attractive sitter in the whole of Holbein's art... Holbein was actually there, who happened to be the greatest portrait painter of his time. Of all the portraits that Holbein did at the English court, the portrait of Cromwell has always seemed the least flattering to it's subject, the most viciously mocking... Imagine Thomas More, the beautiful saint, and Cromwell, the monster, united in art and history, now facing each other, (through) Holbien and time and chance. Question 1: Study sources 1, 5 and 11. Use these images to describe your impression of these three men's personalities. Question 2: Read the introduction and study sources 2, 3 and 4. Why did Hans Holbein decide to live and work in England? Question 3: Waldermar Januszczak was educated in a Catholic School. Read source 6 and explain how this might have influenced his view of Sir Thomas More. Read source 16 and explain how this might have influenced his view of Thomas Cromwell. How does he use Hans Holbein's portraits of More (source 5) and Cromwell (source 11) to support his opinion of these two men? Question 4: The portraits of Sir Thomas More (source 5) and Thomas Cromwell (source 11) are housed in the Frick Art Museum in New York City. Read source 7 and explain if Joan Acocella's opinion of these two paintings are similar to those expressed in your answer to question 1. Question 5: Read source 8. What does the novelist, Hilary Mantel, mean by her comment: "Holbein’s portrait is both the source of their characterisation, and a reinforcement of it." Question 6: Study sources 13, 15 and 17. 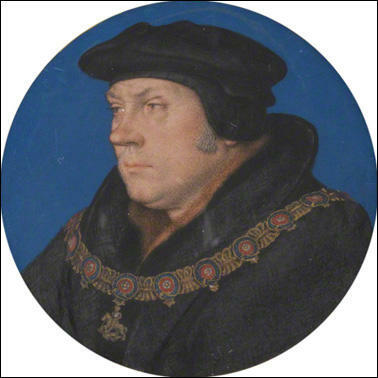 Compare these paintings of Thomas Cromwell with the one painted by Hans Holbein (source 11). Question 7. Read the comments you made about Richard Southwell in your answer to question 1. Does the information in sources 9 and 10 help to explain your original comments? Question 8. Do you think Hans Holbein's religious views influenced the art that he produced? It is worth reading about Hans Holbein, Thomas More, Thomas Cromwell and Richard Southwell before answering this question.